Jingle all the way to Hilton Petaling Jaya this festive season for delicious Christmas and New Year treats with family, friends and loved ones. December has always been a month fill with rejoice, laughter and lots of indulgence. It’s also the month that brings precious gatherings and new memories of togetherness, good times, surrounded by love and merriment. Hilton Petaling Jaya is taking everyone on a merry gastronomic journey this month filled with irresistible yuletide indulgences in all its dining eateries. Feast on a myriad of mouth-watering dishes this Christmas Eve dinner buffet at Paya Serai Restaurant, priced at RM179 nett per adult. There’s plenty international cuisines in the buffet besides the festive dishes. 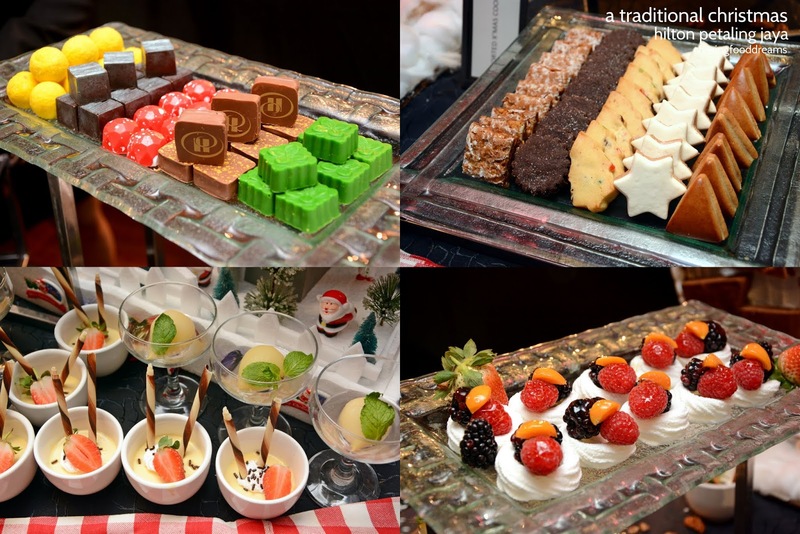 There is also a Christmas Day High Tea buffet priced at RM189 nett per adult as well. Tuck into scrumptious Roast Turkey with all the trimmings. From succulent slices of turkey to stuffing, roasted vegetables, giblet gravy and various flavours of cranberry sauces, there’s also plenty of other meats from the carving station. Roasted Whole Lamb, Roasted Prime Rib and Roasted Venison will have meat carnivores sing with galore at sight. There’s plenty of side dishes and gravies to go with all the roasts as well. One particular highlight of the buffet is Executive Sous Chef Badrul Risham’s twist on the classic Cranberry Sauce. There’s Masala Cranberry, Wasabi Cranberry, Sambal Cranberry and more. While these may sound odd, the variations are actually really deliciously fruity with a punch. Other highlights include Spiced Roasted Chicken with Rosemary Sauce, Duck with Blood Orange Sauce, Oven Baked Chicken Cordon Bleu, Salmon Roulade with Baby Spinach and more from the hot warmers. 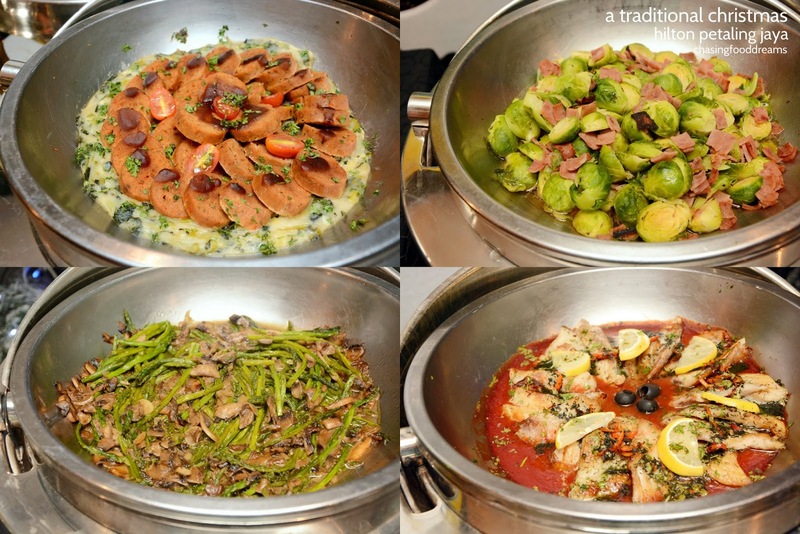 There’s also plenty of sides such as the classic Buttered Brussels Sprout with Glazed Turkey Ham, Green Asparagus with Mushrooms, Honey Glazed Carrots, Roasted Vegetables, Buttered Corn and more to go with all the mains. Don’t miss the Seafood on Ice station! Besides the fresh Oysters, Mussels, Prawns, there also Poached Salmon with ‘Chaud Froid’ and Smoked Salmon, a seafood galore to celebrate the festivity. Besides the Western delights, there are plenty of Asian local dishes as well. From Malay to Chinese and Indian as well as Japanese, it’s a global feast of choices. There is even a BBQ station as well as a Pasta station. While its easy to go all out with savory, it’s the sweets that one should save room for this Christmas season. A luscious French Croquembouche, Christmas Stollen, Fruit Cake, Yule Log, mini Fruit Meringues, Cherry Pies, Dark Chocolate Brownies, Christmas Cookies and Chocolates are on the list to be savored. Make this Christmas the best that it could be by celebrating the Hilton way! Diners who spends RM 250 in a single receipt will get a chance to win daily ‘mystery gifts’ consisting of Christmas treats and goodies! Visit their F&B blog at www.ZestPJ.com for the latest F&B promotions. Call Festive counter for bookings at +603 7955 9122 ext 4067 / 4260 / 4261. If you wish to bring home some of our gastronomic delights like the roasted New Zealand sirloin, sautéed vegetables and roasted juicy leg of lamb is readily available for that scrumptious Christmas dinner at home. Ginger bread house & Santa Claus, assortments of Christmas cookies, delicious Christmas Yule Logs and assortments of mini minced pies is also available for take-away at our Christmas Market at Café Cino. Celebrate Christmas and New Years with a twist. 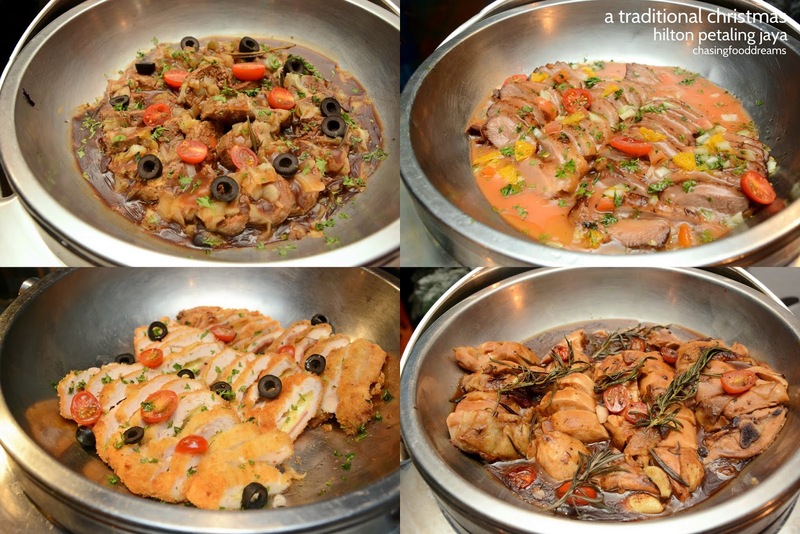 Our authentic Chinese feast is a must for a reunion and for those well deserving celebrations. Christmas Eve set is available for lunch and dinner priced at RM 150 Nett per person. Also enjoy our New Year’s Eve set at RM 150 Nett. Indulge in the very best of our festive line up with the finest Japanese cuisine that will surely leave you with moments for an unforgettable experience at our newly refurbished Genji Japanese Restaurant. Christmas Eve & New Year’s Eve Buffet Dinner from 6.30pm -10.30pm is priced at RM 185 Nett per adult and add on RM 50 Nett to enjoy free flow of wine, sake, beer, soft drinks or juices. So delicious.Nice post.I will try to cook this coming weekend and i am sure my guests will surely love this.Thank you for sharing this post with us.Awesome effort.